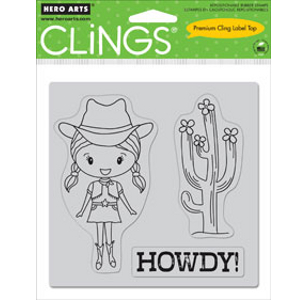 This Howdy cling stamp set comes from Hero Arts, and features a cute cowgirl, a cactus and the word "Howdy!". It's made from deeply etched top quality rubber for a lifetime of use. It clings to an acrylic block (not included) and has a full-sized indexed label for precise and easy placement.